KUCHING: Infrastructure upgrading in the city will be the basis for the promotion of Sarawak as an adventure tourism destination. Tourism and Heritage Minister Datuk Amar Abang Johari Tun Openg said the upgrading works would involve infrastructure related to culture and nature. 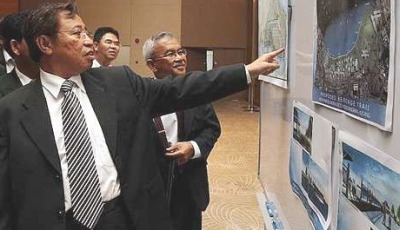 Johari said tourism players in the state had been informed of the Kuching Heritage Trail upgrading which involved the extension of the Kuching Esplanade to Sungai Bintangor. The project, he said, would involve a cost of RM25mil and was expected to be completed either at the end of this year or first quarter of next year. “We will also transform Kampung Boyan from a traditional Malay kampung into a modern kampung with modern facilities. “We also want to turn our river into a mode of transportation where the people, including the tourists, can use it to travel, for instance, from Pasar Satok right up to the Borneo Convention Centre Kuching,” he told a press conference after a meeting and dialogue session with tourism players here yesterday. The Brooke Dockyard, which is along the Kuching Heritage Trail, would also be turned into a cultural centre while three electronic billboards costing RM1mil each would be installed at the riverbank, Johari added. He said the idea of introducing perahu bandung could also be an attraction and to showcase the vibrancy of the Sarawak River. “For us to attract tourists, we need strategic marketing approach which involves branding our tourism based on adventure. “We have to market our product and link it with history as tourists are interested with our history and they will explore it,” he said. On air connectivity, Johari said discussions would be held with Malaysia Airlines to bring in more tourists from certain routes like Australia and Europe. “The airport runway has been extended to accommodate aircrafts like Airbus A380.MAS needs the passenger load and on our side, we need to create the attraction for the tourists to come. So it is a bread and butter issue,” he said. On the Borneo Cultural Festival (BCF), Johari said the Sibu Municipal Council (SMC) had only decided to postpone it to next year. “I have consulted Second Finance Minister Datuk Seri Wong Soon Koh and SMC. This is due to the state election last month where they were busy with its preparation. They do not mean to cancel it. “If we want to do it, we might as well do it properly and put up a good performance for the festival,” Johari said. Recently, SMC said it would cancel the BCF due to SUPP’s poor performance in the state election and this drew criticism from various quarters.